First, Sen. Anthony Petruccelli announced that he is resigning his First Suffolf and Middlesex Senate seat and a Democratic primary election is scheduled for Tues, April 12 to fill the vacancy. In the primary there are 7 Democratic candidates seeking this State Senate seat (and the eventual winner will still have to face reelection in November). The candidates are State Rep. Jay Livingstone (Beacon Hill) who has garnered the endorsement of all of Cambridge’s city councillors, Joseph Boncore (Winthrop), Lydia Edwards (East Boston), Diana Hwang (East Boston), Steve Morabito (Revere), Dan Rizzo (Revere), and Paul Rogers (East Boston). The general election, likely a formality with the only non-Democrat being Donald Logan Willyard (R-Revere), is scheduled for Tues, May 10. It is rumored that City Councillor Leland Cheung may challenge Sen. Pat Jehlen for her Second Middlesex Senate seat this fall. I have not yet heard of any potential challengers to Sen. Sal DiDomenico for his Middlesex and Suffolk Senate seat. On the State Representative side, City Councillor and State Rep. Timothy J. Toomey will be seeking reelection to his 26th Middlesex State Rep. seat. He will be challenged by activist Mike Connolly who ran unsuccessfully against Toomey several years ago. 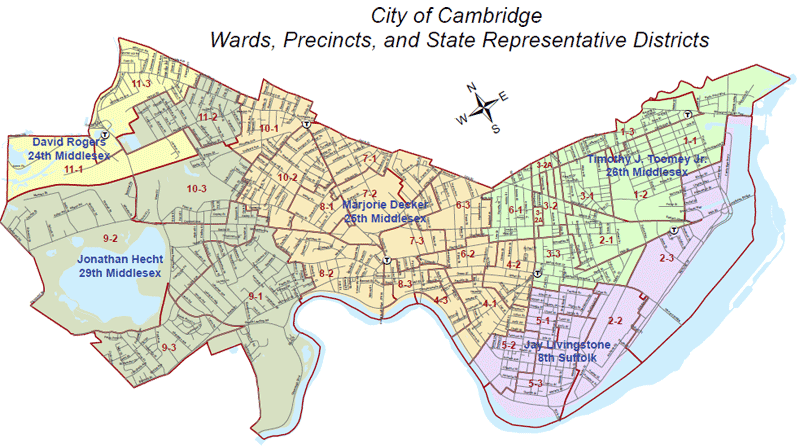 In the interim, Connolly ran unsuccessfully for Cambridge City Council last November. State Rep. Marjorie Decker will likely again be challenged by perennial candidate Lesley Phillips for the 25th Middlesex seat. I have not yet heard of any challengers to Rep. David Rogers (24th Middlesex) or Rep. Jonathan Hecht (29th Middlesex), though I’m sure there are some potential candidates at least thinking about it. As for the 8th Suffolk State Rep. seat currently occupied by Jay Livingstone, that all depends upon how he fares in the April 12 primary. If he is successful, that would open up his State Rep. seat and we’ll have to wait and see who expresses interest in that seat. If unsuccessful, Rep. Livingstone could try again for the Senate seat in the fall or seek reelection to his current State Rep. seat. The Democratic and Republican primaries for Anthony Petruccelli’s open Mass. Senate seat is April 12; the election will be May 10th. On Tuesday, March 8, the Cambridgeport Neighborhood Assn. will host a Meet the Candidates as part of their March meeting at the Central Square Library. From 6-6:30pm there will be time to mingle with the candidates; from 6:30-7:30pm candidates will present short statements, followed by a short Q&A. Attending will be: Joe Boncore, Lydia Edwards, Diana Hwang, Jay Livingstone, Steve Morabito, and Dan Rizzo. At 7:30pm, City Arborist David Lefcourt and Maggie Booz, Co-chair of the Cambridge Committee on Public Planting, will speak about the care of young City trees. A short update about Magazine Beach and the listserv will follow. The meeting will be in the 2nd floor Community Room at the Central Square Library at 45 Pearl Street. Refreshments will be served. All are welcome. Episode 37 of Cambridge InsideOut with guest State Senator Sal DiDomenico (Part 1). This was broadcast on Tues, Feb 18, 2014 at 5:30pm. Episode 38 of Cambridge InsideOut with guest State Senator Sal DiDomenico (Part 2). This was broadcast on Tues, Feb 18, 2014 at 6:00pm. Until we get separate results, the totals for Charlestown and Allston-Brighton will be reported together under Charlestown. These are now official vote totals. Sal DiDomenico won this election by a margin of 181 votes. The Somerville Journal reported that candidate Flaherty filed for a recount of the ballots cast in Everett. This recount was expected to commence on Saturday, Sept 25, but Tim Flaherty has now rescinded his request for a recount. For comparisons, the results of the April 2010 Special Primary Election may be found at: http://cambridgecivic.com/?p=616. 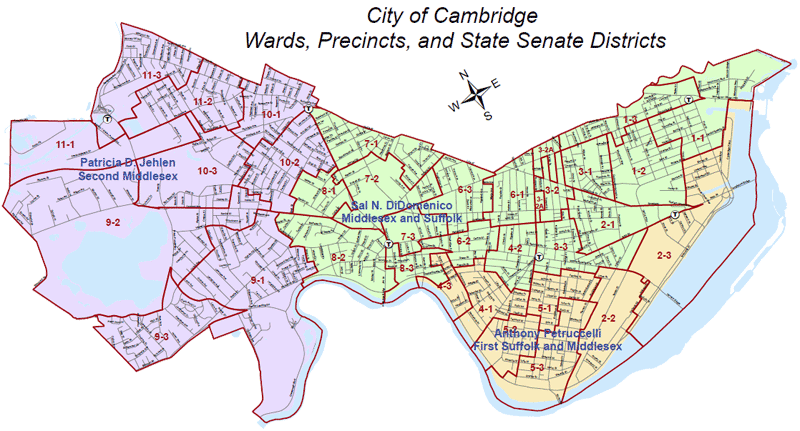 Here are the summaries for all candidates seeking office in districts which are wholly or partially in Cambridge. The table is sortable in each field by clicking on the top row. You can also click on the candidate’s name to go to his or her OCPF page (Office of Campaign & Political Finance). DiDomenico, Sal Senate: Middlesex, Suffolk & Essex 6/1/2010 8/27/2010 $3528.83 $84880.00 $62547.18 $25861.65 $28250.00 $1500 in late contributions after Aug 27 are not included. Total receipts for primary is $86,380. Grand total for year is $195,335. Candidate loan to campaign is $28,250. DiDomenico, Sal Senate: Middlesex, Suffolk & Essex 1/1/2010 5/31/2010 $19201.42 $108955.00 $124627.59 $3528.83 $1550.00 Previous report. Flaherty, Tim Senate: Middlesex, Suffolk & Essex 6/1/2010 8/27/2010 $292.47 $60550.00 $28080.09 $32762.38 $16000.00 $11,500 in late contributions after Aug 27 are not included. Total receipts for primary is $72,050. Grand total for year is $226,339. Candidate loan to campaign is $16,000. Flaherty, Tim Senate: Middlesex, Suffolk & Essex 1/1/2010 5/31/2010 $756.91 $154289.00 $154753.44 $292.47 $0.00 Previous report. Tolman, Steven Senate: 2nd Suffolk & Middlesex 1/1/2010 8/27/2010 $149758.53 $60098.00 $77044.91 $132811.62 $0.00 $500 in late contributions after Aug 27 are not included. Petruccelli, Anthony Senate: 1st Suffolk & Middlesex 1/1/2010 8/27/2010 $10693.69 $56675.00 $66000.04 $1368.65 $0.00 $2,000 in late contributions after Aug 27 are not included. Hecht, Jonathan House: 29th Middlesex 1/1/2010 8/27/2010 $136.45 $3000.00 $0.00 $3136.45 $0.00 $1,500 in late contributions after Aug 27 are not included. This table will be updated as reports come in. The filing deadline was Tues, Sept 7. Democrat: ANTHONY W. PETRUCCELLI (incumbent) Republican: FRANK JOHN ADDIVINOLA, JR.
Do you approve of a law summarized below, on which no vote was taken by the Senate or the House of Representatives before May 4, 2010? SUMMARY: This proposed law would remove the Massachusetts sales tax on alcoholic beverages and alcohol, where the sale of such beverages and alcohol or their importation into the state is already subject to a separate excise tax under state law. The proposed law would take effect on January 1, 2011. SUMMARY: This proposed law would repeal an existing state law that allows a qualified organization wishing to build government-subsidized housing that includes low- or moderate-income units to apply for a single comprehensive permit from a city or town’s zoning board of appeals (ZBA), instead of separate permits from each local agency or official having jurisdiction over any aspect of the proposed housing. The repeal would take effect on January 1, 2011, but would not stop or otherwise affect any proposed housing that had already received both a comprehensive permit and a building permit for at least one unit. Under the existing law, the ZBA holds a public hearing on the application and considers the recommendations of local agencies and officials. The ZBA may grant a comprehensive permit that may include conditions or requirements concerning the height, site plan, size, shape, or building materials of the housing. Persons aggrieved by the ZBA’s decision to grant a permit may appeal it to a court. If the ZBA denies the permit or grants it with conditions or requirements that make the housing uneconomic to build or to operate, the applicant may appeal to the state Housing Appeals Committee (HAC). After a hearing, if the HAC rules that the ZBA’s denial of a comprehensive permit was unreasonable and not consistent with local needs, the HAC orders the ZBA to issue the permit. If the HAC rules that the ZBA’s decision issuing a comprehensive permit with conditions or requirements made the housing uneconomic to build or operate and was not consistent with local needs, the HAC orders the ZBA to modify or remove any such condition or requirement so as to make the proposal no longer uneconomic. The HAC cannot order the ZBA to issue any permit that would allow the housing to fall below minimum safety standards or site plan requirements. If the HAC rules that the ZBA’s action was consistent with local needs, the HAC must uphold it even if it made the housing uneconomic. The HAC’s decision is subject to review in the courts. A condition or requirement makes housing “uneconomic” if it would prevent a public agency or non-profit organization from building or operating the housing except at a financial loss, or it would prevent a limited dividend organization from building or operating the housing without a reasonable return on its investment. A ZBA’s decision is “consistent with local needs” if it applies requirements that are reasonable in view of the regional need for low- and moderate-income housing and the number of low-income persons in the city or town, as well as the need to protect health and safety, promote better site and building design, and preserve open space, if those requirements are applied as equally as possible to both subsidized and unsubsidized housing. Requirements are considered “consistent with local needs” if more than 10% of the city or town’s housing units are low- or moderate-income units or if such units are on sites making up at least 1.5% of the total private land zoned for residential, commercial, or industrial use in the city or town. Requirements are also considered “consistent with local needs” if the application would result, in any one calendar year, in beginning construction of low- or moderate-income housing on sites making up more than 0.3% of the total private land zoned for residential, commercial, or industrial use in the city or town, or on ten acres, whichever is larger. A YES VOTE would repeal the state law allowing the issuance of a single comprehensive permit to build housing that includes low- or moderate-income units. A NO VOTE would make no change in the state law allowing issuance of such a comprehensive permit. SUMMARY: This proposed law would reduce the state sales and use tax rates (which were 6.25% as of September 2009) to 3% as of January 1, 2011. It would make the same reduction in the rate used to determine the amount to be deposited with the state Commissioner of Revenue by non-resident building contractors as security for the payment of sales and use tax on tangible personal property used in carrying out their contracts. The proposed law provides that if the 3% rates would not produce enough revenues to satisfy any lawful pledge of sales and use tax revenues in connection with any bond, note, or other contractual obligation, then the rates would instead be reduced to the lowest level allowed by law. The proposed law would not affect the collection of moneys due the Commonwealth for sales, storage, use or other consumption of tangible personal property or services occurring before January 1, 2011. A YES VOTE would reduce the state sales and use tax rates to 3%. A NO VOTE would make no change in the state sales and use tax rates.